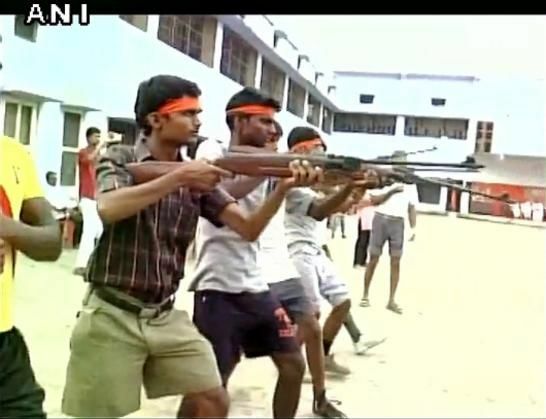 Home » national news » Why is the Bajrang Dal giving arms training to its workers? The Bajrang Dal is reportedly training its party workers to use weapons to protect Hindus in Uttar Pradesh. According to a report in The Times of India, Bajrang Dal has set up camp in Ayodhya and is training its volunteers to use rifles, sword and lathis. According to the report, the outfit is all set to organise similar camps in various cities - including Sultanpur, Gorakhpur, Pilibhit, Noida and Fatehpur - on 5 June. The training is reportedly being carried out to "protect Hindus from non-brothers". In the past, the Bajrang Dal has come under heavy criticism for instigating violence - including assaulting a Muslim man in June 2015 and attacking couples on Valentine's Day.